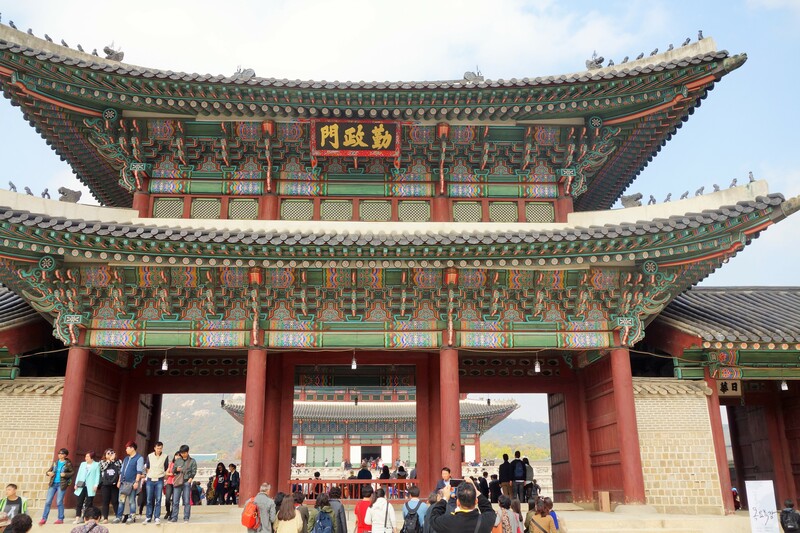 Gyeongbokgung Palace (경복궁) , a traditional Korean tea and exploring the “most international area in Seoul”- Iteawon. Many Asian countries have their own identity; though this may be subjective depending on whether you are native or foreign, we found Japan to be traditional and China to be an intriguing mix, a country which sometimes lives up to its first world international persona and other times is languishing behind with marked (but often internationally hidden) third world dimensions. 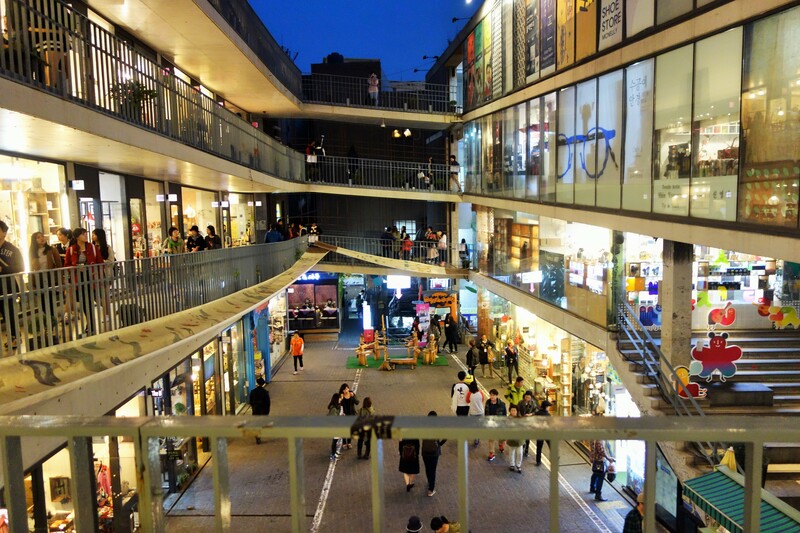 South Korea, however, is a delightful borrower. 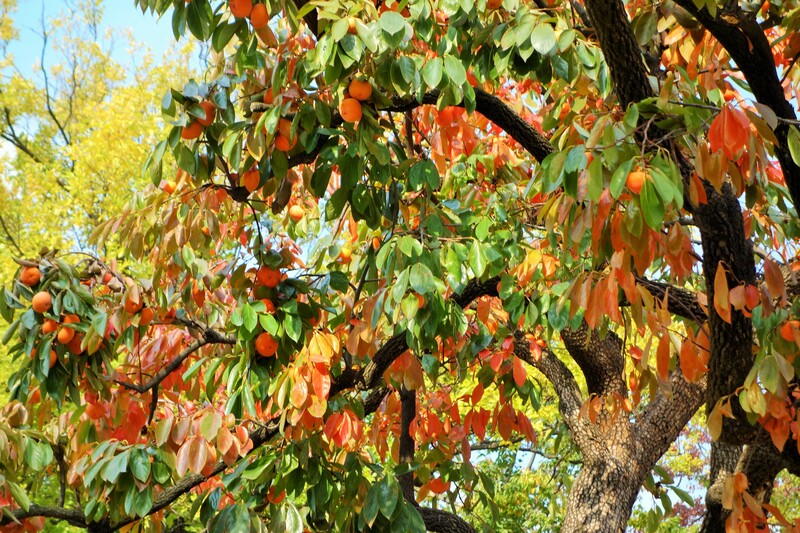 It shows off aspects of Japanese and Chinese heritage, yet is influenced by another country as well- the United States. And as testimony to that influence, we started our day that morning at Dunkin Donuts for breakfast. Having never been fortunate enough (or indeed, able to afford) to go the United States, this was my first introduction to the popular American brand. And I enjoyed it- my travel companion and I sat with long onion and garlic bagels and lattes, and Anna had a doughnut and a coffee. 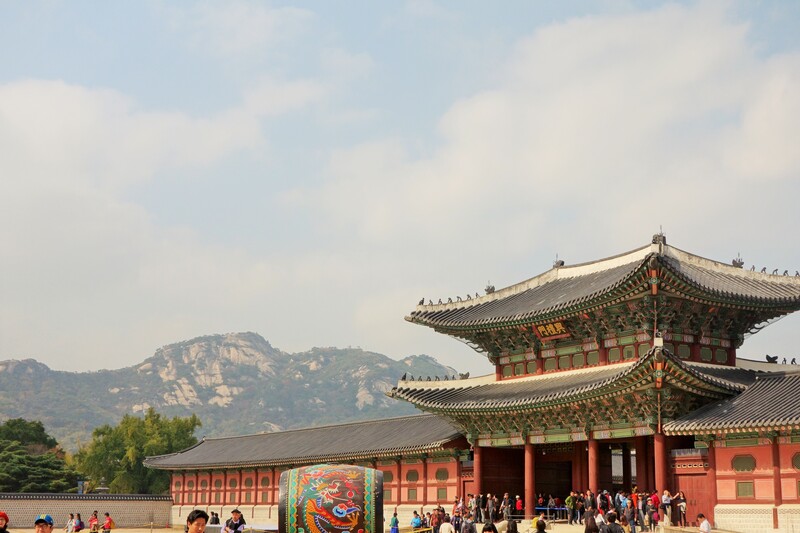 Having finished breakfast at this nearby train station (we could have also gone to a nearby Starbucks or Baskin & Robbins if we so wished), we hopped onto the metro to where Gyeongbokgung Palace was located. 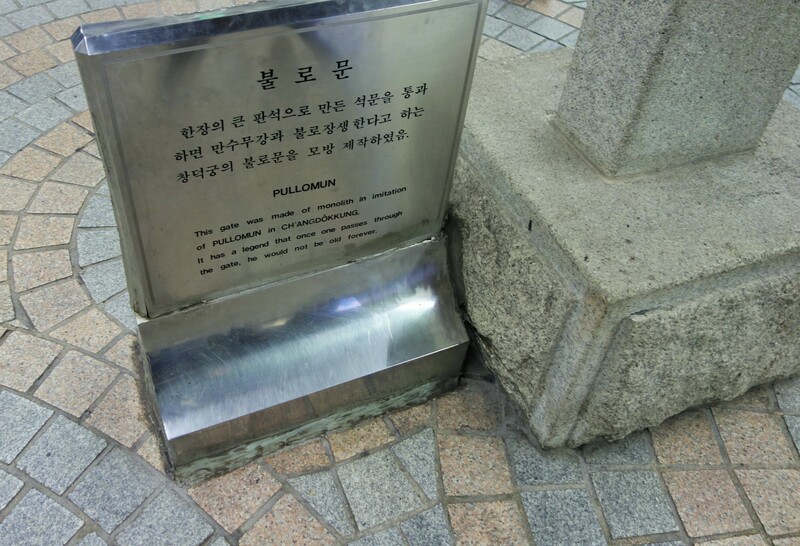 At the nearby train station, the Pullomen langors. 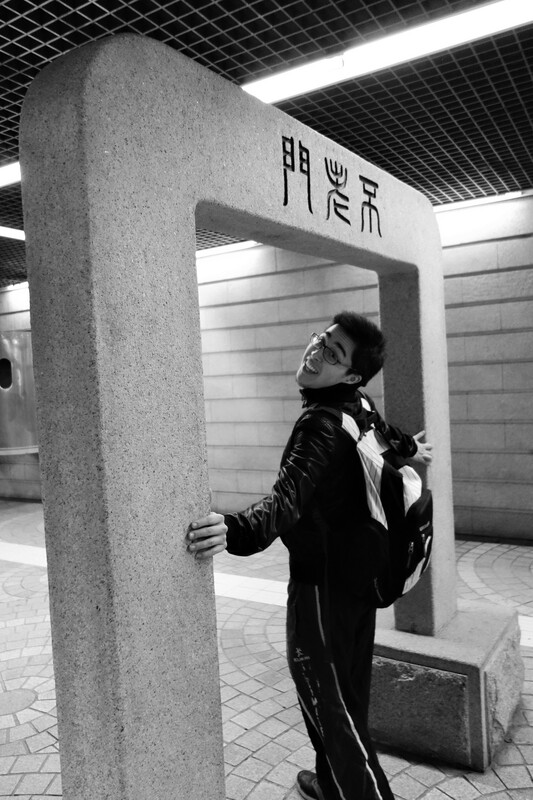 Legend has it that if you walk through the stone arch, you will never grow old. Guess who wants eternal youth!!! 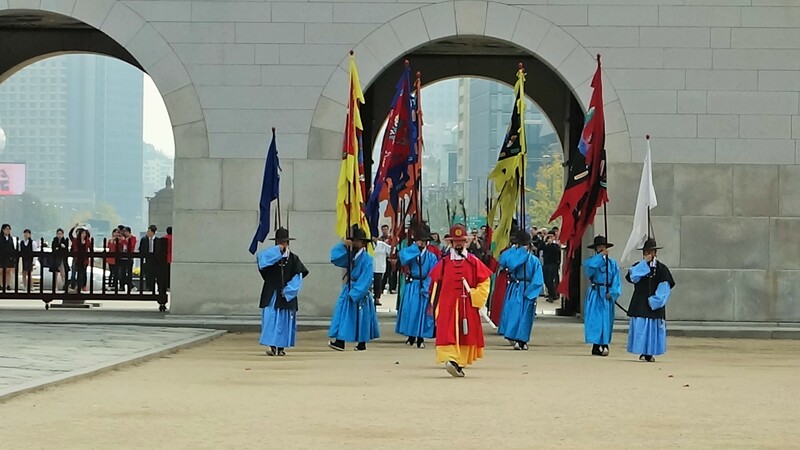 Gyeongbokgung had a few surprises in store for us; for one thing, the Changing of the Guards (typically reminiscent of Buckingham Palace) also exists here. 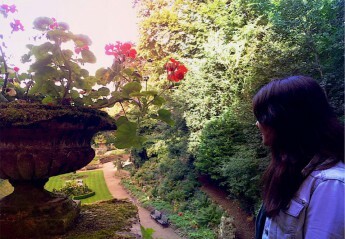 And watching the procession was amazing! 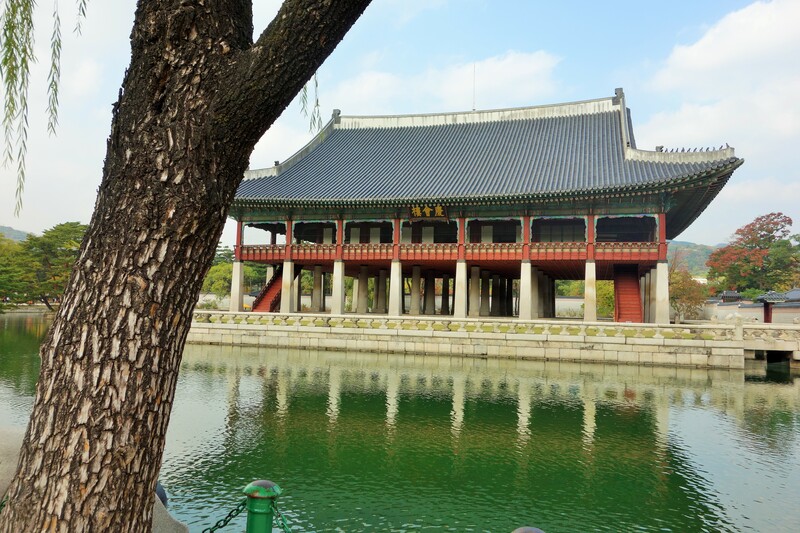 There are some very interesting things to note about Gyeongbokgung. 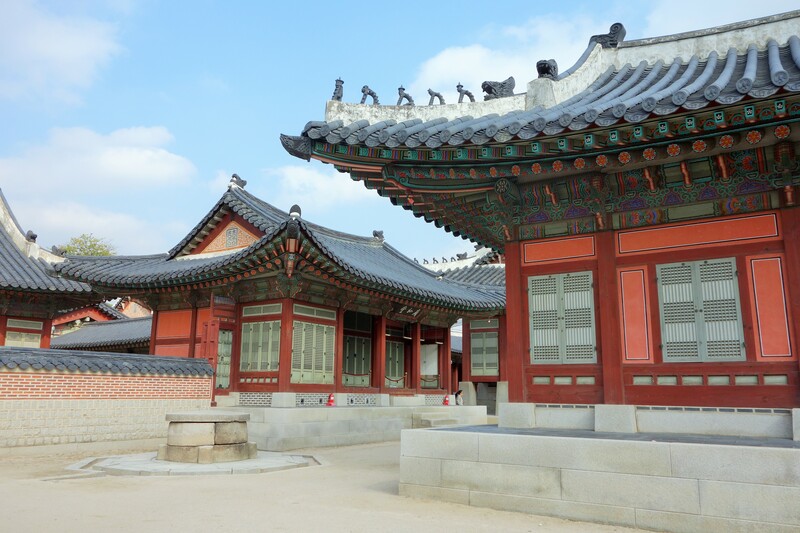 For one thing, it was built in 1395 but it burnt down by fire in 1592 after a Japanese invasion. The Palace was restored in 1867, and whilst there were initially 500 buildings, only 125 now remain (I paid attention to our tour guide on the English group tour). 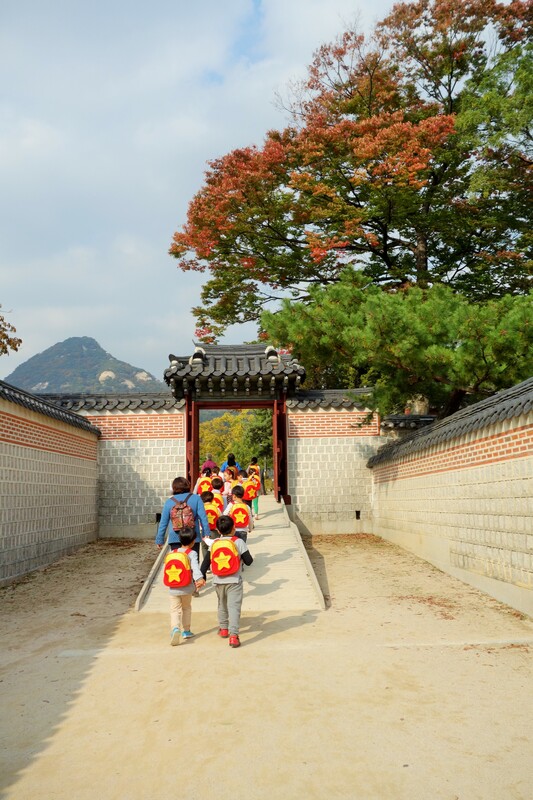 Also, it is useful to note that if you are a young Korean student, you can get into Gyeongbokgung palace for free provided you have proof of age. The palace was beautiful- adorned with a lake, gardens and buildings made up of colourful materials, most commonly a dusty cinnamon colour. 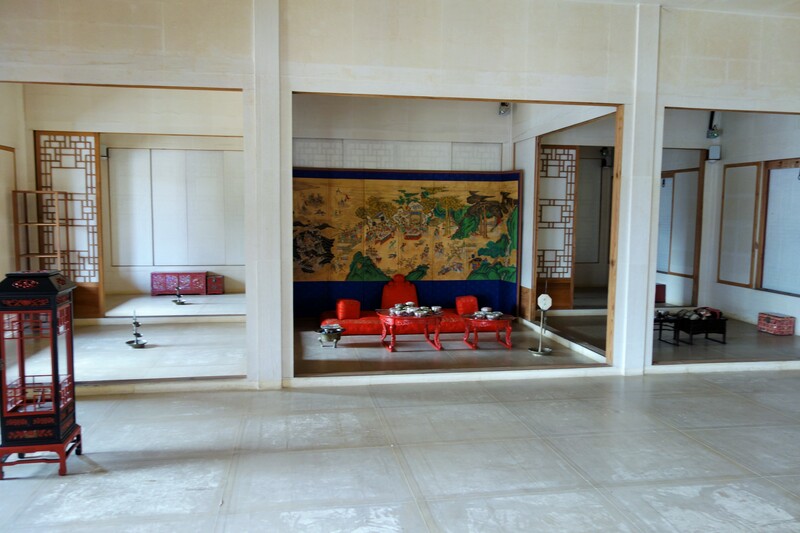 We were allowed to walk around the King’s chamber (though, as expected, the furnishings and paintings were behind a rope barrier) but the Queen’s chamber was more closed off to the public. 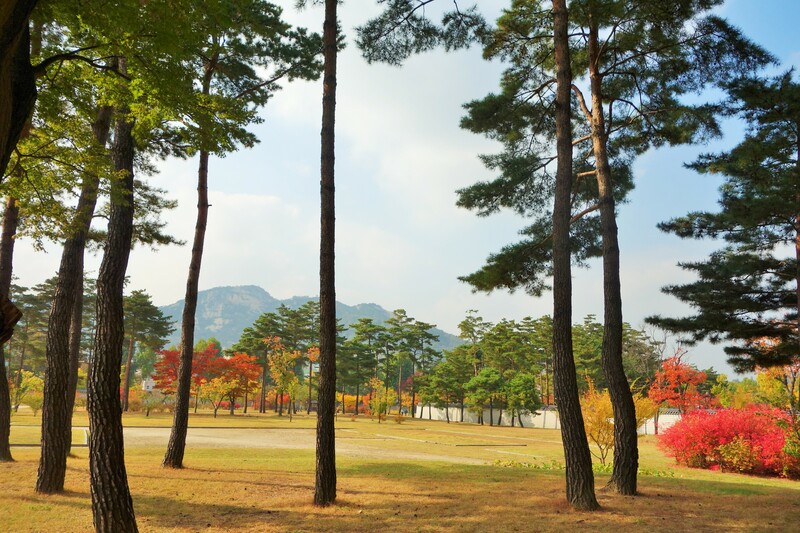 After we finished exploring Gyeongbokgung palace (경복궁), we moved on to Insa-dong (인사동) to find something to eat. 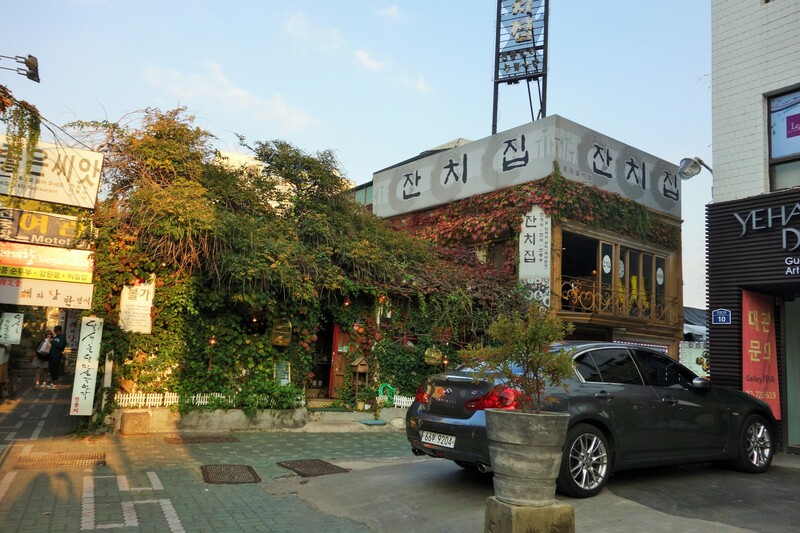 Anna had done prior research on a vegan restaurant, called Ohseagyehyang (오세계향) in the area. We headed through the lanes of souvenir shops, including those selling your typical tourist items to those whose windows were filled with marvellous homemade ceramics, paintings and jewellery. 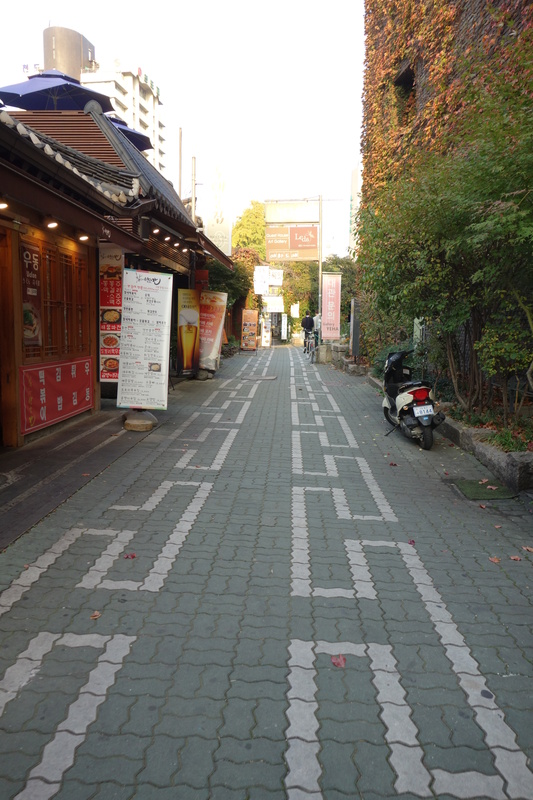 As we reached our destination, it transpired that the vegan restaurant was shutting for a little while whilst staff went on a break. We were all very hungry, and a bit unsure as to what to do in the meantime; however, it turned out that we needn’t have worried! 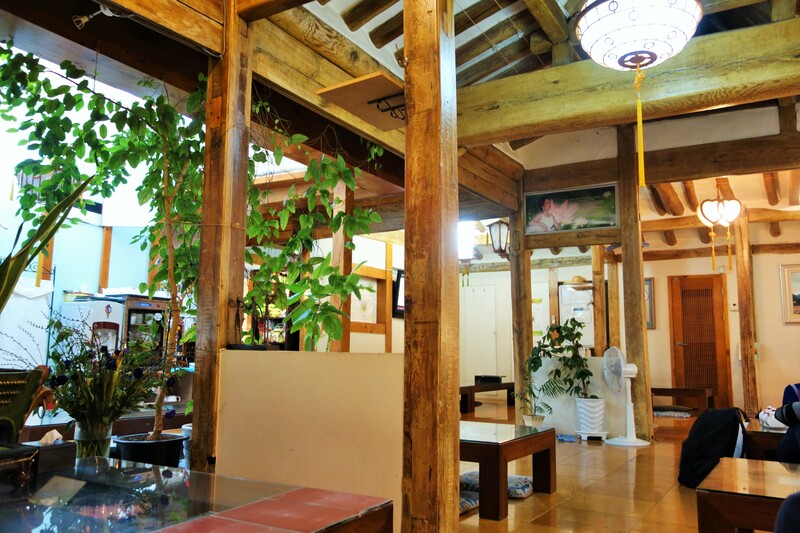 Nearby lay a cute, traditional Korean tea shop. 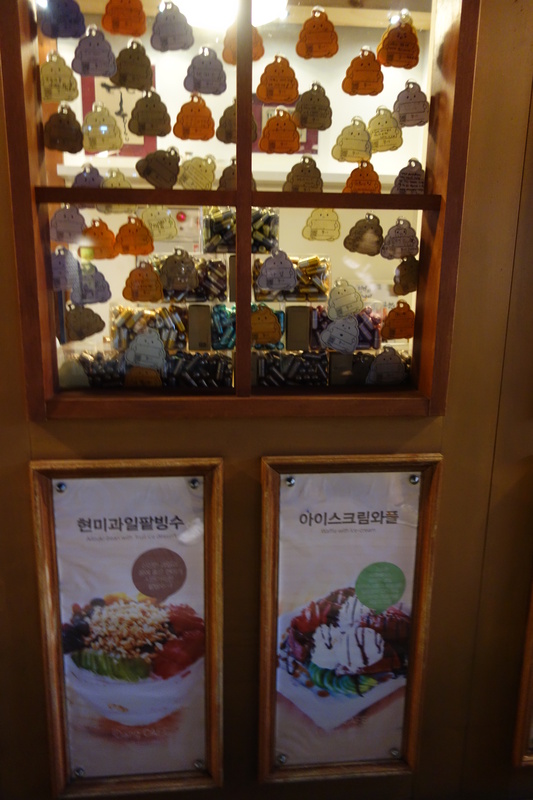 We walked around the side and removed our shoes (as is customary when entering a home and some restaurants in Seoul) and climbed some stairs until we entered the tea area. 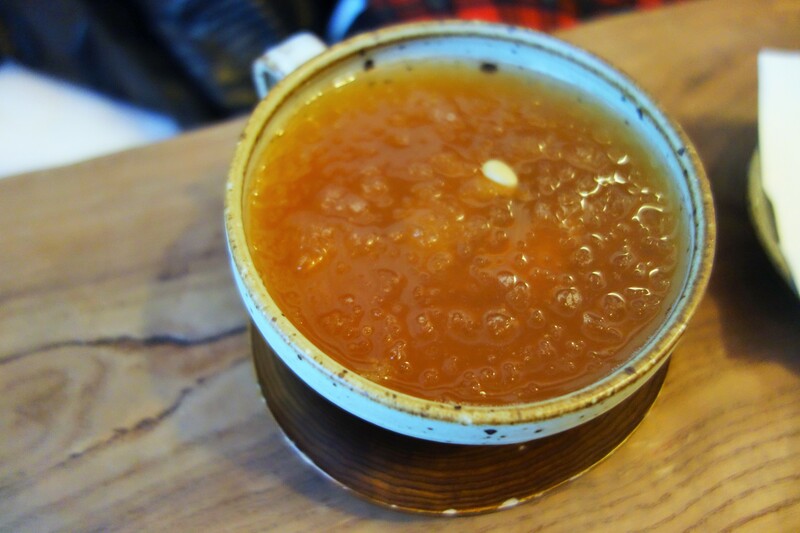 Sujeongwa/cinnamon punch (cold)- which was lovely! 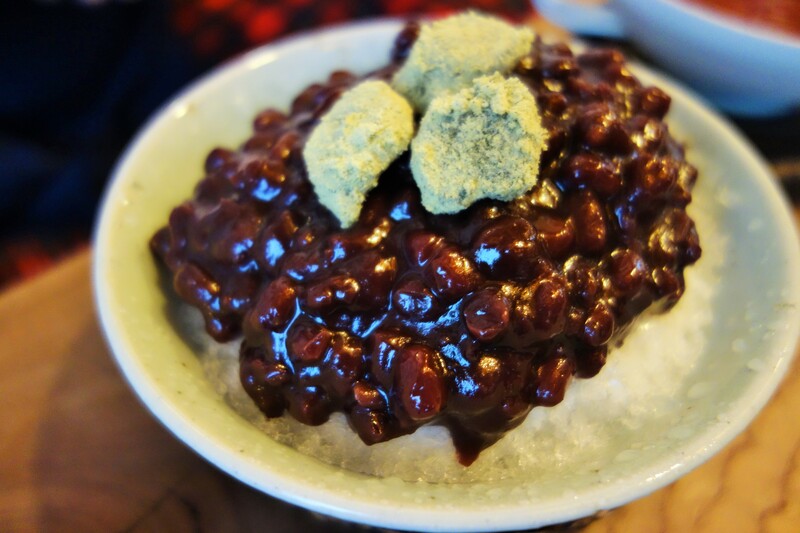 Patbingsu (red bean ice dessert)- which I wasn’t keen on but Anna and my friend (who comes from Hong Kong) enjoyed. Perhaps it is just less suited to a Western palate. 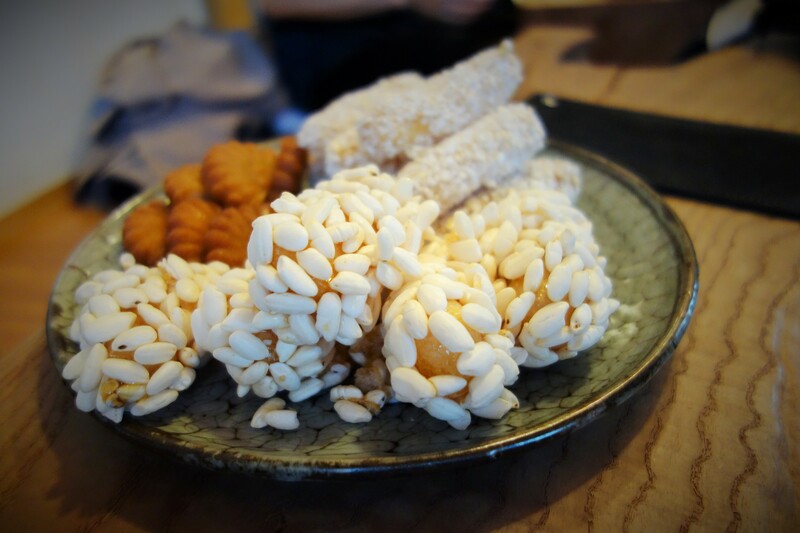 A sweet set- full of light rice cookie-esque treats- this was my favourite- so yummy! 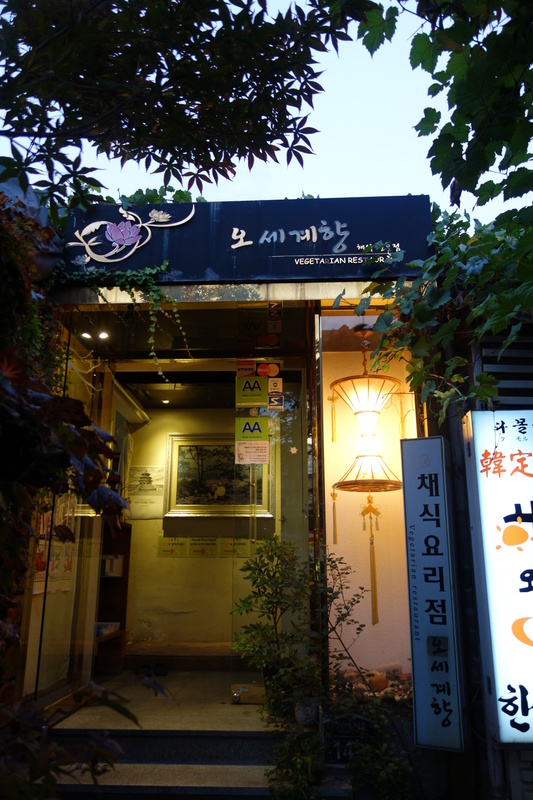 After we had finished tea and let food digest a little, we went on to Ohseagyehyang (오세계향) for a late lunch/early dinner. Picture of the exterior of the vegan restaurant. 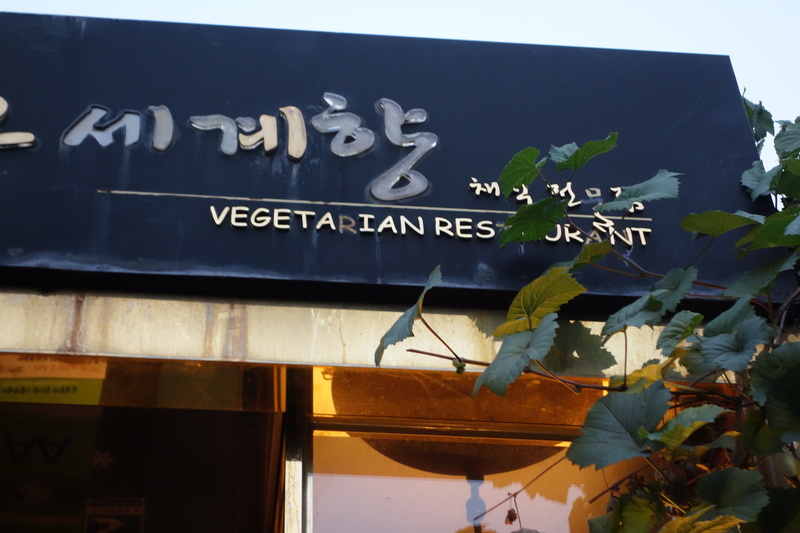 Note that it says “vegetarian” because it used to serve dairy and eggs before it became vegan. 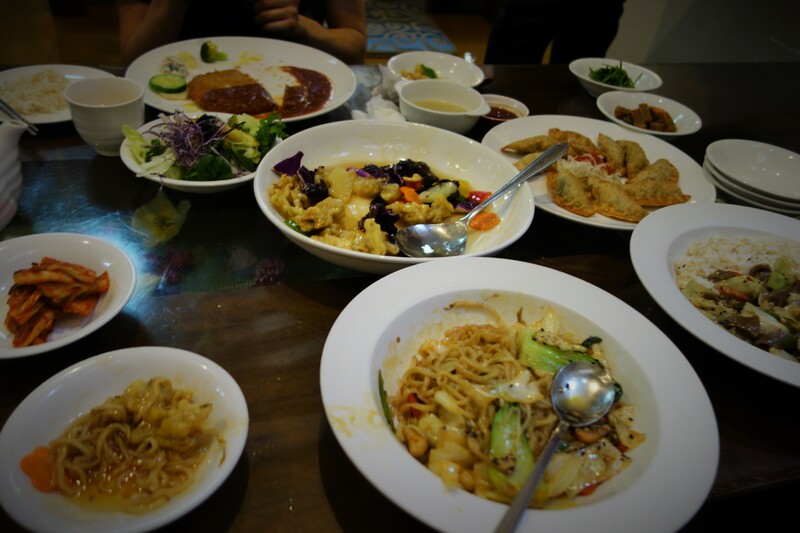 The three of us had mixed opinions regarding the food but I really loved my dishes, which consisted of a spicy Chinese-style noodle dish and vegetable dumplings. 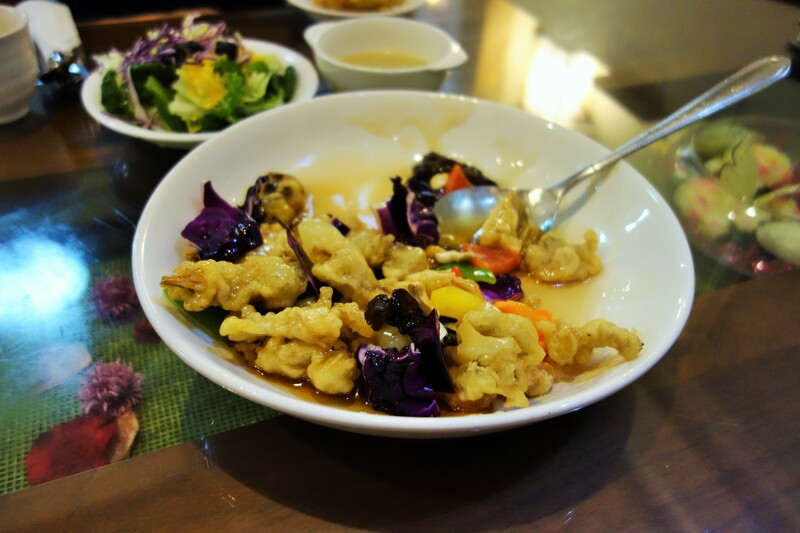 Anna also ordered this really lovely mushroom filled batter dish, served in a moreish sweet and sour sauce. Finally, we headed to Iteawon, somewhere that Anna described to us as being “the most international area” in Seoul, and somewhere with a large variety of nightlife. We headed out with the intention of grabbing some drinks, and after heading into a very international nightclub full of (I hate to say it) creepy Western guys staring at any young female, we made a sharpish exit. 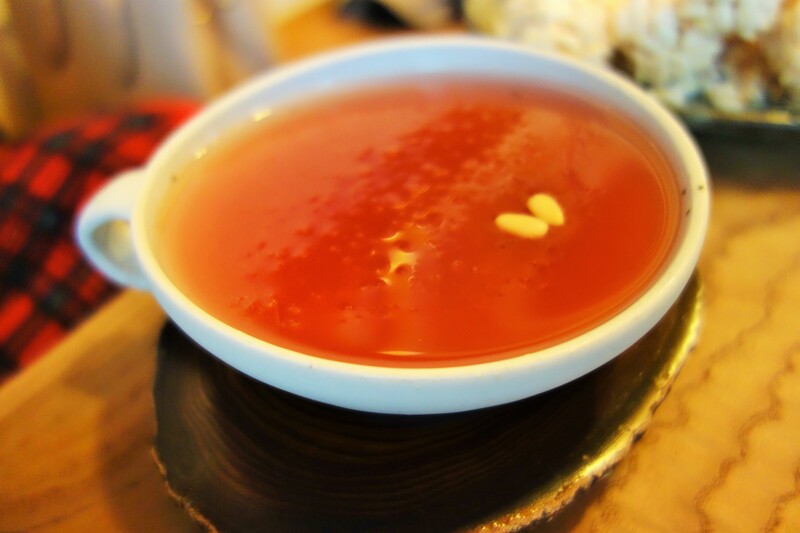 We stumbled across a little French restaurant and bar called Un Deux Trois. Since the cocktail menu was impressive here and the restaurant had a lovely, sophisticated ambience, we sat down for drinks and Anna and I shared a gorgeous cheese board (I always have a lot of love for Goats cheese). I also ordered a wonderful blueberry cocktail- whilst I can’t remember exactly what ingredients it consisted of, it was more like a dessert since alongside liquor, it consisted of vanilla ice cream and was topped with chocolate shavings. Eventually we decided to head back to our hotel and just have a few drinks, chat and chill. 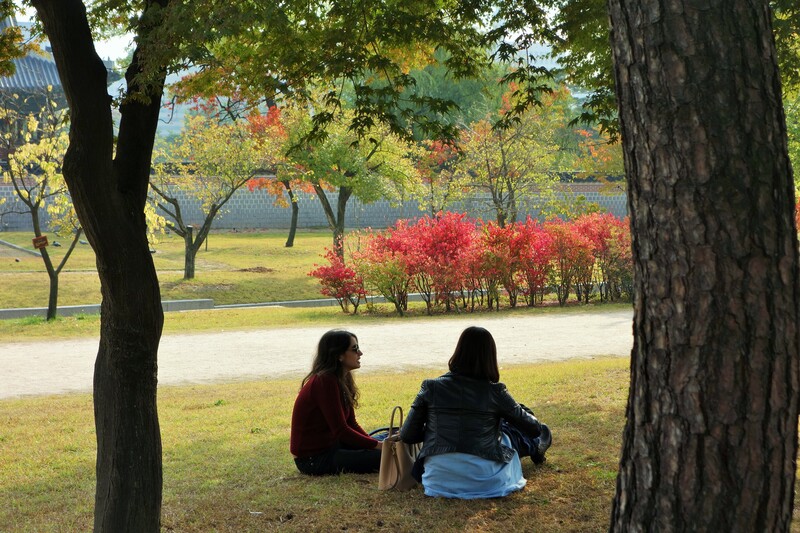 Tomorrow was our final day in Seoul, and we were determined to make it a memorable one.